e-Recorder is a voice recorder that it is easy to use with a multi-functional. 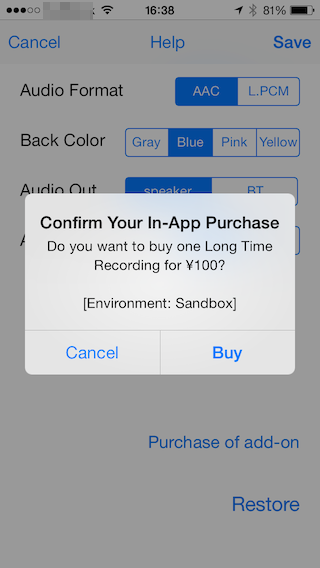 When you launch the application first, you will be asked permission to use the microphone. Please press the [OK] button. Then, the screen will appear as follows. Recording volume is the standard value by moving the slider to the far left. Recording volume will increase by moving to the right. 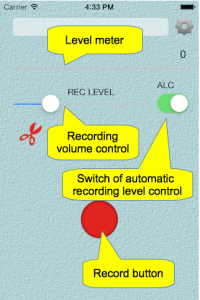 ALC (automatic recording level control) feature is suitable for recording the meeting. When you press the Record button to start recording. The file name is a combination of the date and time, but you can change later. If you exit the app while recording, it will continue to be recorded in the background. It will continue recording when you start the other apps. However, recording will stop when received a phone call. Please press the record button again if necessary. 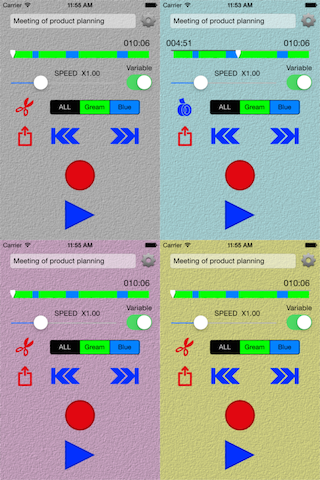 This app will stop recording automatically after 3 minutes. 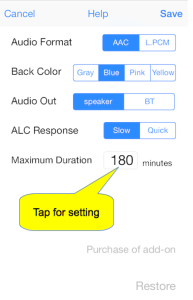 In addition, with the purchase option ($ 0.99), you will be able to freely set the automatic recording stop time. If the Bluetooth headset already paired is connected, the headset microphone is automatically selected. The following figure shows the screen during recording. 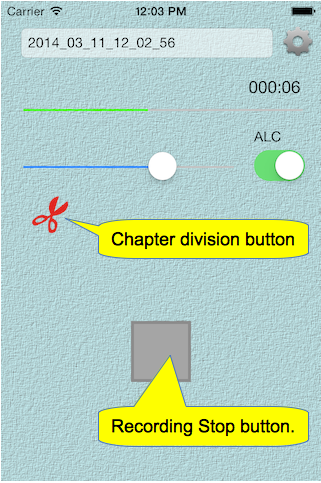 When you press the “chapter division button”, chapter information is added to the recorded file. By the chapter division, playing the part of the target will be able to easily. The following figure shows the screen when you stop recording. By moving the “playback position display bar” during playback, playback of any position is possible. The chapter display area, the chapter is displayed in green and blue. 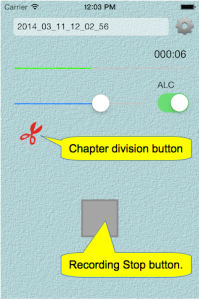 When you press the “chapter division button” during playback, it will be divided into chapters anew. 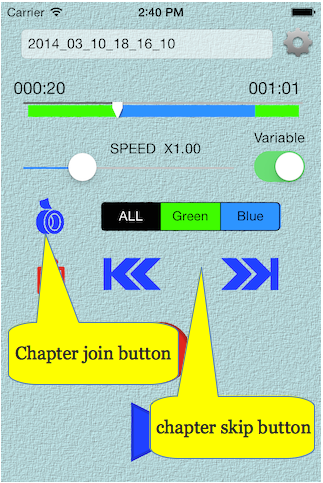 By pressing the “chapter skip button”, you can jump to a chapter back and forth. 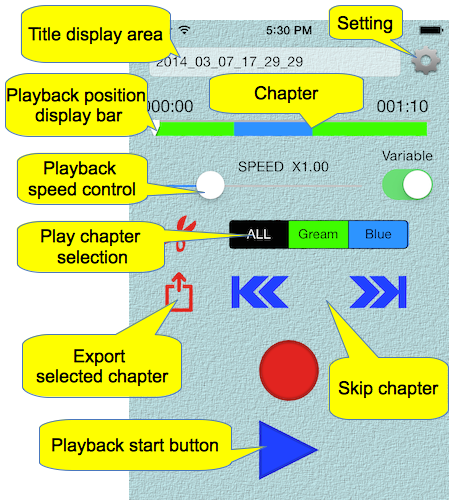 When you press the “chapter skip button” when playback is stopped, “chapter division button” changes to “Chapter join button”. 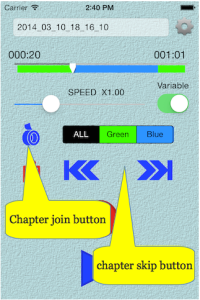 When you press the “play chapter selection button”, to play only chapter blue or green, either. 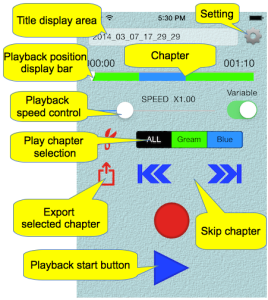 By pressing the “Select Chapter Export button”, a new recording file of only chapter that you selected is made. The file name will be something that adds _export to the original file name. If you tap “title display area”, the recording file list screen as shown below will be displayed. If you want to delete a file, after you have selected the file, please press the top right of the screen the “delete button”. Or by swiping to the left the name of the file you want to delete, please press the Delete button that appears on the right side. 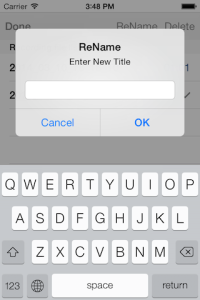 If you want to change the title, After selecting the file, please press the top of the screen to “Title Changes” button. A dialog like the following image is displayed, please enter a new title. If you want to modify part of the file name before, please use the pasteboard. File name of the previous are copied to the pasteboard. After you press and hold the input area, and then paste the file name of the previous, please make any necessary corrections. When you press the “Settings” button on the first screen, the screen will appear as follows. 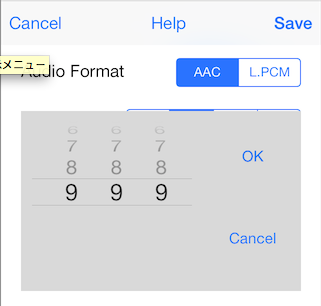 Linear PCM and AAC can be selected for recording format of the file. File size is about 500K bytes per minute if the AAC. Linear PCM is about 5.3M bytes per minute. Please select the AAC usually. 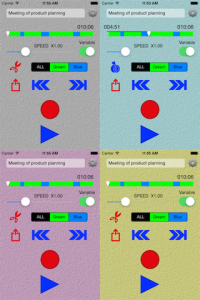 Background color of the recorder can be selected from four. Please pick the one of your choice from among the following figure. 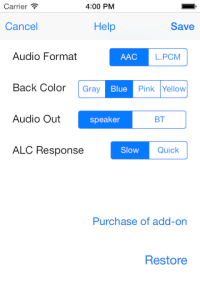 Play will take precedence over the built-in speaker Bluetooth device even though it is connected. If you want to produce sound from the Bluetooth device you are using a microphone built-in Bluetooth speaker,Please select the [output][BT]. 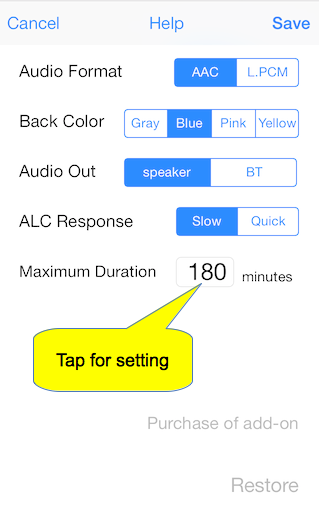 “ALC response time”, you can select two types of quick and slow. Towards the “Quick” will quickly follow the magnitude of the sound. However, because there are times when the sound becomes unnatural, please select the recording source for each. 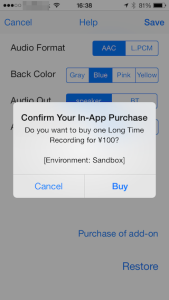 You can purchase the “long recording options” by pressing the “purchase of add-on”. Inquiry screen as shown below will be displayed when you enter the password after you press the button. Please press the “button to purchase” If you want to buy. It is Do not press the “Cancel” button if you do not want to purchase. Please press the “Restore” button if you have also installed the iPad to buy in the Phone and the case was re-install the app. Restoration of purchase information is available. Purchase is complete, the item “Maximum Duration” will now be displayed as shown in the figure below. Picker will appear when you tap the part of the number, please set your favorite time. The recorded data that you can download to your computer using the iTunes. Select the iPhone connected with iTunes, please select the [APP] further. 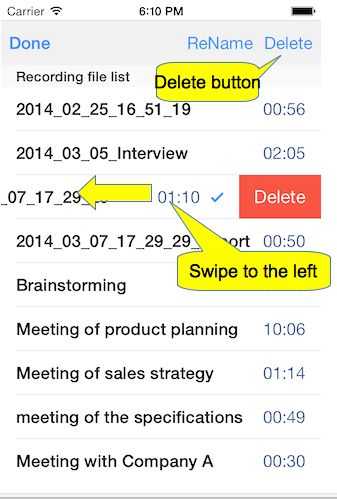 Documents e-Recorde is displayed in the window on the right side If you choose e-Recorder from the App list. The recorded data is a file “. Caf” extension. Please copy to your computer what you need.